The OSIRIS-REx mission is driven by five major science objectives. 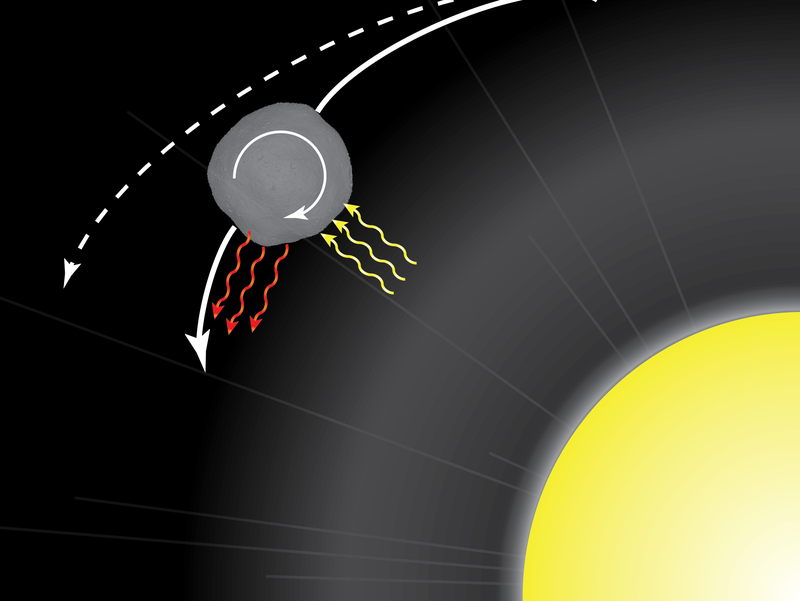 One of these objectives is to “Understand the interaction between asteroid thermal properties and orbital dynamics by measuring the Yarkovsky effect on a potentially hazardous asteroid [Bennu] and constrain the asteroid properties that contribute to this effect.” Read on to find out what this means and how we will get it done. In order to effectively manage a science team containing over 80 people, I have divided them up into twelve different working groups. Each group is assigned a subset of our mission science requirements. Based upon these assignments, the working groups develop their section of the Science Implementation Plan – our guidebook for how to achieve OSIRIS-REx mission success. The working group responsible for characterizing the orbital variation of Bennu over the course of Solar System history is the Dynamical Evolution Working Group, or DEWG for short. The DEWG is tasked with reconstructing the orbital history of Bennu from the main-asteroid belt to near-Earth space and on into the future. One of the DEWG’s main objectives is to constrain the short-term dynamical evolution of Bennu. Most importantly, they constrain the timeline for Bennu-Earth close approaches in the past and future. They are using this information to understand the impact hazard that Bennu represents and define measurement by the spacecraft that will further refine the probability of impact. How Do We Know Where Bennu Is? The first step in reconstructing Bennu’s history and predicting her future is to accurately determine her present orbit. The science of determining a celestial object’s orbit based on telescopic observations is called astrometry. Bennu has an orbital period that results in a close pass with the Earth every six years. It is only during these close approaches that Bennu becomes bright enough to be observed with ground-based telescopes or with the Planetary Radar System. Bennu was discovered on September 11, 1999 by the Lincoln Near-Earth Asteroid Research (LINEAR) survey. She reappeared in the sky in 2005 and again in 2011. Between September 11, 1999 and January 20, 2012, 561 telescopic and 29 radar astrometric measurements were made by a number of professional and amateur astronomers from around the world. As a result, the orbit solution that we have established for Bennu is now the most precise in the asteroid catalog. For example, the uncertainly on her semi-major axis (the longest dimension of her orbital ellipse) is 6 meters out of 168,505,699.049 kilometers. This is equivalent to measuring the distance from New York to Los Angeles with accuracy smaller than 1/64th of an inch! Where Will Bennu Be in the Future? Once we have determined her current orbital state, the next step is to predict where Bennu will be in the future and where she has been in the past. This seems like a simple task – just use Kepler’s three laws of planetary motion, run the calculations backward and forward in time, and you are done – right? Wrong! When calculating the orbital trajectory of Bennu we need to include not only the gravitational effect of the Sun, but also that of the eight planets, the Moon, Pluto, and any asteroids that might perturb her orbit. For the asteroids, we first included the four largest asteroids (1 Ceres, which is officially a dwarf planet, 2 Pallas, 4 Vesta, and 10 Hygeia). We then computed and included the orbits for the next 12 largest main-belt asteroids. Finally, we added nine more asteroids, which we selected according to an analysis of which ones could most significantly influence the orbit of Bennu. It is not just the mass of the planets that affect Bennu’s orbit – but also their shape. When Bennu is near the Earth we have to model the gravitational perturbation due to the Earth’s oblateness (i. e. the Earth has a round shape that is flattened at the poles). We found that unless the effect was included, whenever Bennu is closer than 0.3 AU, there is a modest but discernible error on the orbit determination and propagation. Einstein showed that Kepler’s laws, as generalized in Newton’s Law of Universal Gravitation is only true as long as the strength of the gravitational field is weak. As it turns out, we have to include the effects of Einstein’s General Relativity to predict Bennu’s orbit with the same accuracy as our astrometric measurements. We used a full relativistic force model including the contribution of the Sun, the planets, and the Moon. The relativistic effects of the Sun are very important. In addition, we found that the Earth’s relativistic terms are responsible for a significant variation because of short-range effects during Bennu’s close approaches to the Earth in 1999 and 2005. Finally, we have to include the Yarkovsky effect to fit an orbit for Bennu. This slight non-gravitational acceleration arises because of the way Bennu absorbs and re-emits the energy from the Sun. Bennu receives the majority of solar energy at noon, local asteroid time. She hangs on to this energy as a result of a property called the thermal inertia of her surface. The energy is then re-radiated back into space as heat sometime during Bennu’s afternoon. The radiation of thermal energy either accelerates or decelerates the asteroid, changing her orbital path. The Yarkovsky Effect is acting to slow Bennu down – decreasing her semi-major axis and possibly sending her on a collision course with the Earth. So, Where is my Asteroid? As a result of all this hard work, we now know where Bennu has been and where she is headed between 1654 and 2135. In 2135 Bennu will pass 300,000 km (186,000 miles) over the surface of the Earth and be closer than the Moon. We don’t know enough about Bennu to accurately predict what will happen to her orbit as a result of this encounter. Beyond 2135, our calculations are statistical in nature. We do know that Bennu has a high probability (~1 in 3,000 chance) of impacting the Earth soon after this, sometime in the 2175 – 2196 time frame. The work on Bennu’s trajectory is lead by Steve Chesley – a member of my Science Team with prime responsibility for calculating Bennu’s orbit. Steve is a member of the JPL Near-Earth Object Program Office – whose job it is to keep an eye on all of the space rocks that may be hazardous to the Earth. The DEWG is leading many other exciting studies of Bennu’s past and future. Stay tuned for more information!